The Sunshine Award recognizes bloggers whose writings “light up the dark corners of our minds” The rules are simple and provided below: (1) Thank the person who gave you the award in your blog post. (2) Do the Q&A below. (3) Pass on the award to 10 – 12 deserving and inspiring bloggers, inform them and link to their blogs. 1. 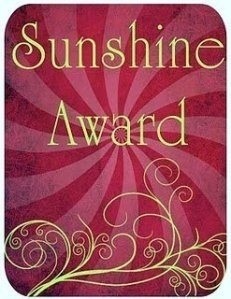 Thanks so much to Kate from A Hundred Affections (http://ahundredaffections.wordpress.com/) for nominating me for the Sunshine Award. I so look forward to reading her posts for so many reasons. She shares from personal experience in an entertaining and sincere way. She allows readers to walk with her through some very real challenges but maintains her humor, love for life, and love for Christ which truly does shine through each entry. Thanks Kate! Can’t wait to read the upcoming “chapters”! Am believing God for Great things! Favorite animal? We have a puppy named Ava whom I adore, but I think my favorite animal would be birds. I love to hear them sing, watch them fly and just enjoy watching their interactions. Favorite number? Five. I can’t tell you how many 5s I’ve seen on my kids jerseys…from my sons’ many little league baseball uniforms to my daughter’s high school volleyball jersey, to my oldest son’s college football jersey, 5 has been their favorite number for sure. And now it’s mine! Favorite nonalcoholic drink? I love water, coffee (kind of a necessity for me these days! ), and diet Dr. pepper. Favorite alcoholic drink? I have a husband who struggles with alcohol so it’s been a choice of mine to be a teetotaler for decades, but way back when, I loved Khalua and Creme. My Passions? I love to sing and write songs. I love the people in my life…kids, husband, family, friends. I enjoy taking photos, making jewelry,creating things. And bottom line, I love God and hope that my love for Him is at the root of how I live out my interests and passions. 3. Here are my recs for the Sunshine Award. I look forward to reading these blogs and think others will too! They are widely varied, but I really enjoy each one, and the perspectives, images, and insights offered…Thanks for shining your light! Thanks, Kate…I appreciate this fun and encouraging way to follow more blogs that I relate to!